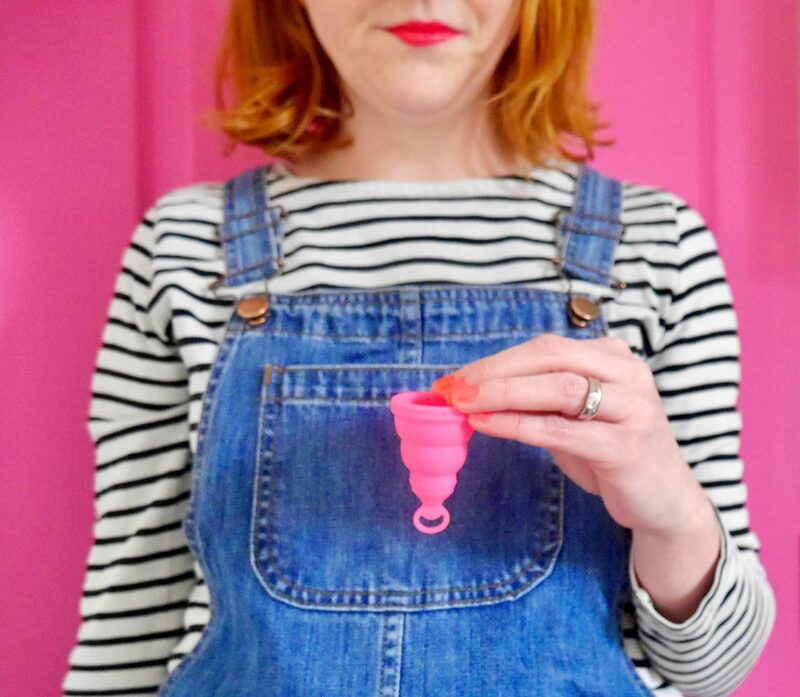 Do you use a menstrual cup / period cup? Would you try one? Shaped along the lines of a more curvy party popper (!) menstrual cups are used internally, during your period, but collect the blood instead of absorbing it. And unlike tampons, they’re reusable. There are many menstrual cups on the market and they come in lots of different shapes and sizes. I’ve been trying the Lily Cup One from Intimina, which is smaller than your average period cup, bright pink and ideal as a starter period cup. It’s fair to say it took me a while to warm up to the idea of using a reusable menstrual cup though. I first heard about them about ten years ago and was perplexed as to why you’d use one when tampons are so…good at their job. Fast forward a decade, and like many people I’m on the look-out for more environmentally-friendly replacement products for everything, where possible. And if I’m honest, one of the things that struck me when I had the first post-baby period – apart from the contraction-like pain and ride on the hormonal roller coaster on a one-way ticket to tears-ville, all of which is more than enough to make you want to get pregnant again, but that’s another post in itself – was how expensive branded tampons are and it irked me more than PMT that as women we have to pay a premium for these products (thanks for nothing again, the patriarchy!). 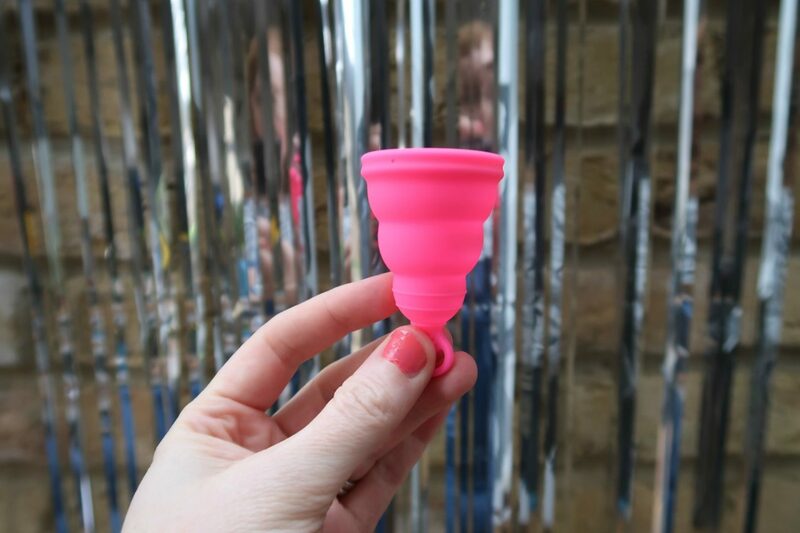 I’d heard a few people rave about menstrual cups though, but trying them was on my never-ending list of ‘things I’ve got to get round to.’ When I was offered the Lily Cup One to review, I thought I’d try it out. What is the Lily Cup One? 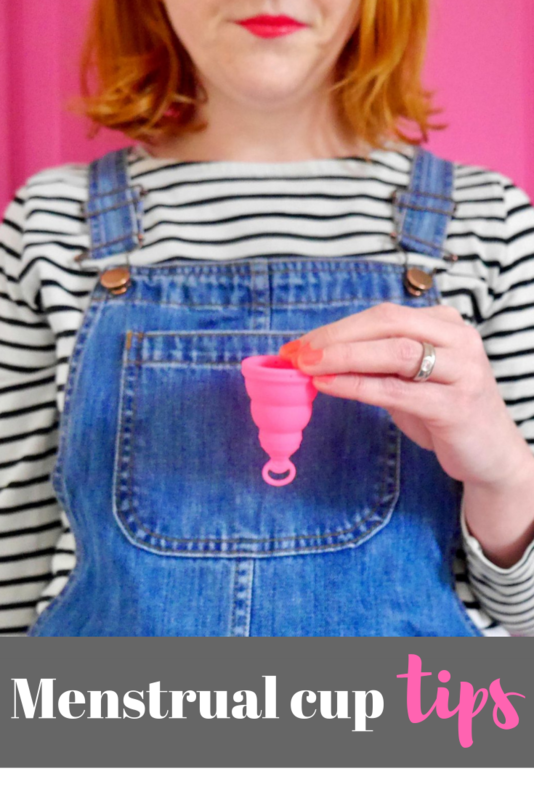 Described as the ‘perfect starter cup’, the Lily Cup One is a more petite period cup, with a double rim that aims to be leak-proof, and there’s also a removal loop at the bottom, instead of the long stem that some menstrual cups have. The Lily Cup One is made of medical-grade silicon (which means less chance of toxic shock syndrome than tampons). It’s bright pink, comes in one size and is designed to be used for up to 12 hours. (It also comes with a pebble-shaped case for easy transporting, although mine seems too sprightly to stay in and keeps springing out). How do you get it in? It looks huge: It’s smaller than other cups but yep, this. There are basic instructions on the box – which I think could be more detailed – and there’s also more information on the website. However, there is a lot of chat about menstrual cups online, so I did some reading around to pick up tips first. Despite all this I did find it took some getting used to. The basic idea is you ‘fold’ the rim first – you can squish it so it looks like the letter c, or you punch one of the sides down into the cup so there’s a bit of a point – you then push it in (and hope for the best!) Due to the flexible silicone the cup is made of, once it’s in place the rim springs open and it forms an o-shaped seal. This means your period blood goes directly into the cup and can’t leak out. How do you know it’s in right? If it’s high enough up, you shouldn’t be able to feel it, and there shouldn’t be any leaks. I did have to re-position it a few times at first as I was never quite sure it was exactly right; it can be difficult to tell when you’re not used to it. How do you get it out? When you take it out, pinch the bottom of the cup first to release the seal, otherwise it might feel like you’re pulling all your internal organs out (been there…). Once you’ve done that, you just pull it out using the handle. Then you tip the blood out, rinse the cup and can use it again (if you’re not near a sink e.g. you’re in a public loo, you can wipe it with a tissue). How long can you use it for? You can use it for 12 hours, but how often you need to take out it depends on your flow. But even on my most feeling-like-death-days I thought I’d have to change it more often, but there was much less blood than I’d thought. One of the weird – or really interesting – things is that it does feel like you get to know your body a lot better. Do you need different sizes depending on your age / stage / how many babies you’ve pushed out? I’m scratching on the door of 40 and I’ve had two children, and the Lily Cup One was fine for me. However there are lots of factors around the what type of cup and size you need, so you might need to do some shopping around to get a perfect fit. Why is it so pink? Why do we have to make everything pink? It is, undeniably, pink. But why not? The packaging is obviously designed to appeal to a younger market, which is surely a good thing to encourage the next generation to make more environmentally-friendly choices. What did I think of the Lily Cup One…and will I keep using it? I have to say that even as a seasoned tampon user, the Lily Cup One took more getting used to than I’d thought. Putting it in and taking it out seemed like a bit of an ordeal each time, and I did spent a lot of time worrying it would leak or thinking it wasn’t in right. However! It does get easier and you do get used to it. Stick with it, because once you’re used to it, there are so many benefits. Leaving it in for much longer than you do with tampons and not having to faff around and change it every couple of hours is great. I went swimming with it in and it was fine. It seems really efficient, and the reusable benefits and environmental impact vs having to dispose of tampons is undeniable. Plus you only have to buy it once, and never have to scrabble around for a tampon again. I’m going to go with the flow and stick with the Lily Cup One. Period. There’s more information on the Lily Cup One website here and buy it here for around £22 – I was sent mine for the purposes of this post. 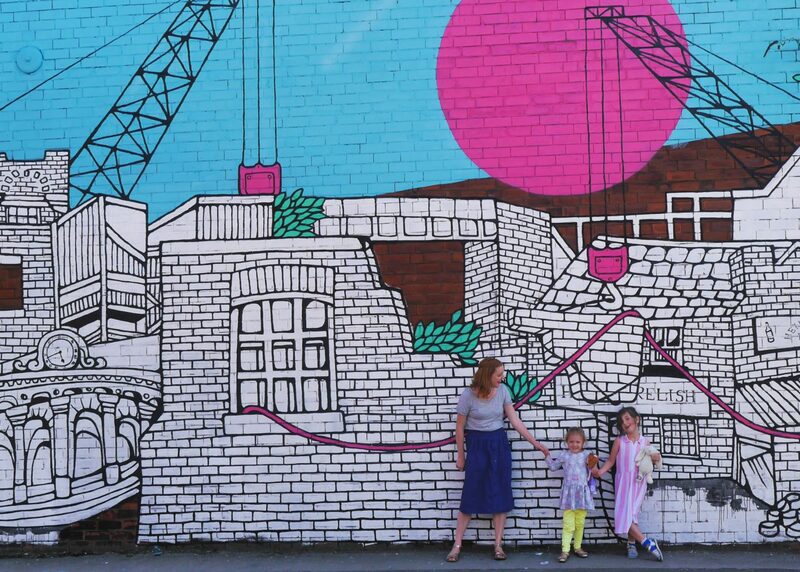 If you’re interested in helping to combat period poverty in the UK, you can get involved with Bloody Good Period which donates sanitary products to refugees and asylum seekers, and the Metro has lots of other ideas for how you can get involved.